Q: How do I use the Advanced Planning and Scheduling System to increase profits? A: It would be good to increase profits by increasing sales and cutting back on costs. Then, how does one go about increasing sales? How do you cut down on costs? 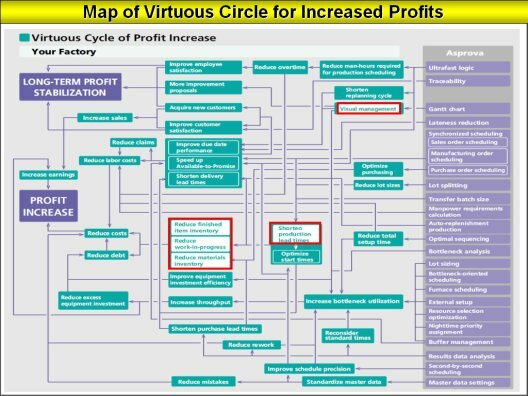 For the answer to that, let's take a look at the "Virtuous Circle Map for Increased Profits." This diagram shows the relationship between "targets for the manager" and the functions of the Asprova Advanced Planning and Scheduling System. The "targets for the manager" shown on the left side of the chart are "increase short-term profits" and "stabilize long-term profits." On the right side of the chart are the "functions of Asprova." There are many factors in maximizing profits and ensuring stabilization of long-term profits (the sections in the middle of the chart). However, these are not intended to be measures that will immediately solve all problems. If we were to attempt to make improvements in a large number of factors at the same time, the length of the project would be extended and the start of results delayed. It is important that we get the first results out as soon as possible. Then we should be able to get the rest of the results step by step. First we actively use the Advanced Planning and Scheduling System for visualization (management seen with the naked eye). Then, use theory of constraints scheduling (simultaneous scheduling) to reduce (manufacturing) lead-time. When lead-time is reduced, warehouse reduction is achieved at the same time. Then use plant and equipment bottleneck research effectively to maximize throughput. I will now explain the methods of visualization, lead-time reduction and maximization of profit using the Advanced Planning and Scheduling System.